Establishing strong, Biblical boundaries is one of the hardest, yet most important things for a betrayed wife to do. Really, for any believer to do. Unfortunately, it’s a task that leaves most of us wondering where and how to even start. Many of us have spent our lives believing that unconditional love looks different than the Bible actually describes it. We mistakenly think setting boundaries is mean, or unloving, or… gasp… un-submissive. In fact, it is often the most loving, God-honoring thing we can do! God sets strong boundaries with us, and He makes it clear in Scripture that we are to do the same in our relationships. All of them. So, we’re going to spend the next 6 weeks exploring what the Bible has to say about boundaries. We’ll learn what Biblical boundaries look like, how to set them up, and how being obedient in this area ultimately puts God in control. WEEK 2: 5 Principles of Healthy Boundaries we Learn from God. WEEK 3: 5 More Principles of Biblical Boundaries we Learn from God. I kinda like both. When we set personal boundaries, we’re ‘drawing a line’ or ‘fixing a limit.’ We’re clearly communicating where the actions of another will reach the extent of our tolerance and thus divide them from us. Boundaries define our borders. Who we are. Where we begin, and where we end. Titus 2:14-15 – He gave His life to free us from every kind of sin, to cleanse us, and to make us His very own people, totally committed to doing good deeds. You must teach these things and encourage the believer to do them. You have the authority to correct them when necessary, so don’t let anyone disregard what you say. A person with no boundaries is a person who is undefined. This will most often result in confusion. Both on the part of those we find ourselves in relationship with, and within ourselves. We won’t know how to proceed when we feel violated, because we won’t know for sure that we HAVE been violated. I struggled with the idea of boundaries for many years! A combination of my own personal baggage, and a misunderstanding of unconditional love caused me to be torn between knowing I couldn’t, and shouldn’t tolerate my husband’s sin, and believing that taking any kind of action would be selfish and unloving. I wrestled with it for years. Each time a new discovery of his acting out would come to light I would feel so helpless. I would clearly communicate to him that it wasn’t okay, but beyond that, I just didn’t know what to do. Since then I’ve learned that just as a clearly marked property line plainly establishes when our borders have been crossed and an individual has violated our property, so a clearly defined personal boundary will do the same for our hearts. We won’t have to explain why or how we were violated. It will be clearly evident by which side of the fence the person stands on! Boundaries are a necessary part of every human relationship! Parents need to establish clear and concise boundaries for their children. Employers need to do the same for their employees, and vise-versa. Friendships need boundaries. Families need boundaries. Church bodies need boundaries within their members. Marriages desperately need boundaries. In fact, even our relationship with God has been established upon clearly communicated boundaries from Him to us. That’s right! Our God is a God of boundaries. He established them. He communicated them. He keeps them. And He commands us to do the same! As I’ve been reading the Bible over the last few years, specifically looking for examples of God’s boundaries, I’ve been blown away! In fact, I challenge you to find a single book of the Bible that doesn’t include a boundary! Whether they are physical, emotional, spiritual or relational. Even creation itself demonstrates His power to define the lines between heaven and earth, land and sea, Creator and created. 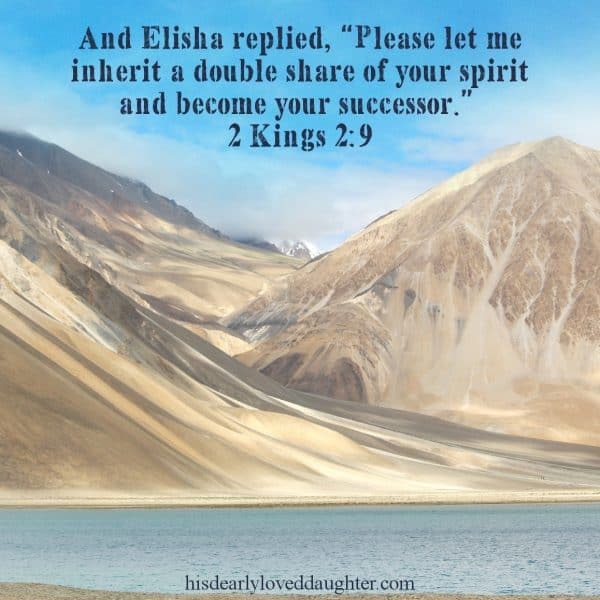 Additionally, our God is a covenant maker, and covenants are basically clearly defined and agreed upon boundaries. From the beginning of Genesis to the end of Revelation God lays out His parameters for His people. Revelation 22:11- -Let the one who is doing harm continue to do harm; let the one who is vile continue to be vile; let the one who is righteous continue to live righteously; let the one who is holy continue to be holy. Blessed are those who wash their robes. They will be permitted to enter through the gates of the city and eat the fruit from the tree of life. Outside the city are the dogs – the sorcerers, the sexually immoral, the murderers, the idol worshipers, and all who love to live a lie. You see, right from the beginning God gave Adam his limits. He told him what he could do, what he couldn’t do, and what would happen if he did it anyhow. And all the way to the very end, God has clearly established His borders and plainly defined who will be allowed inside of them, and who will not. Our God is, without question, a God of boundaries! So, let’s see what we can learn from Him, shall we? Come back next week to see 5 principles we can learn about boundaries from examining God’s boundaries in Scripture. We’ll look at passages from all over the Bible – Old and New Testament, to see if we can gain some understanding of our Father’s heart. *How about you? Have you had preconceptions about boundaries based on the teaching of church tradition rather than the Word of God? Are you skeptical to hear that setting strong boundaries is something God has asked us to do as believers? I’d love to hear about it in the comments below! 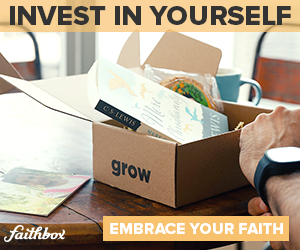 Did you know all the content in this series has been expanded into an interactive workbook full of questions and prompts to help you work through this issue in your own life? 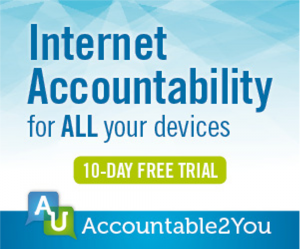 Click through the image below and get yours today! 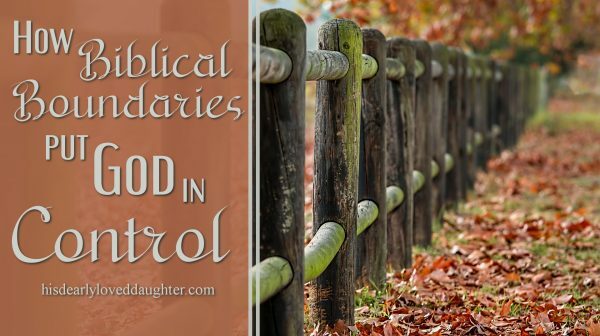 Next Next post: 5 Principles about Healthy Boundaries we Learn from God. Looking forward to reading more about boundaries! I have a hard time with this. Often I wonder if what I am doing is trying to control or manipulate my situation. 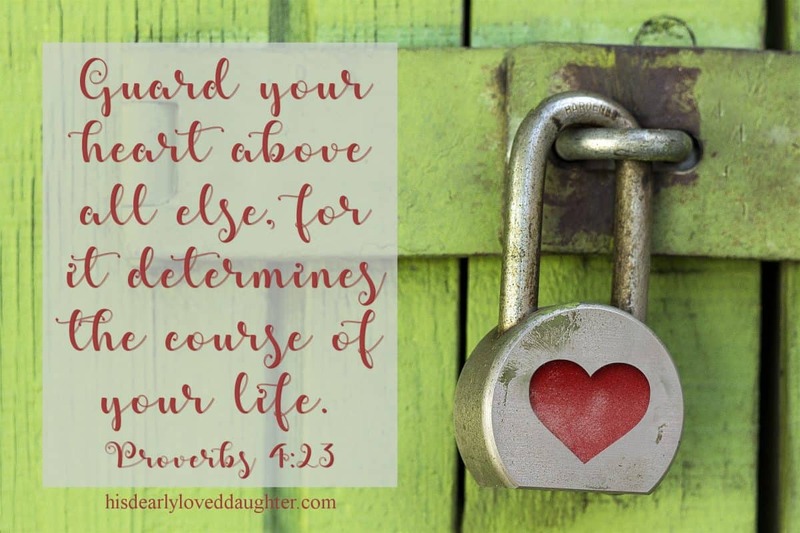 If I already had boundaries in place, it would help me and my husband to see that I am not trying to control things, I am just following through with the boundaries I have set. Yes, having established boundaries really helps with this! In week 5 I’ll provide a free, printable worksheet to help you work through and write out your own boundaries. (Along with a filled out worksheet with one of my boundaries as an example to help you see how it works.) 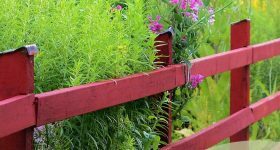 One of the sections on the worksheet will walk you through making sure the boundary is not an attempt to control, but a healthy, Biblical standard that shouldn’t be crossed. I truly hope that you’ll stick around for the series and I pray it really helps! I’ve been studying this issue from Scripture for the past year, and MAN did it help me understand it better! I was so confused before. I am so thankful to God for His Word! It really does have all the answers! Thanks so much! It’s definitely a difficult issue to deal with. I think for all of us. I’m not a naturally passive person, and it’s still really tough for me! Thanks for your support and encouragement Sarah! Love this so much! I lived so much of my life as “undefined” because I didn’t understand boundaries at all. I’d either have open fields around me or build stone fortresses. Neither are life giving! This was so thorough and well-written. Boundaries are essential. After all we are in a war over spiritual territory! Amen Alice! We sure are. This was a eye opener right here: “As I’ve been reading the Bible over the last few years, specifically looking for examples of God’s boundaries, I’ve been blown away! In fact, I challenge you to find a single book of the Bible that doesn’t include a boundary! Whether they are physical, emotional, spiritual or relational.” This is so true! I just never looked at it exactly as that. Great read! I know Carmen, for me too! I couldn’t believe it when that clicked for me. They’re absolutely everywhere in Scripture! I have been always interested in this very topic. I made a compilation of boundaries in different areas written by Grace girls in one of my posts as well. God is the God of boundaries and our lives must be hedged that way as well in our spiritual aspects and physical relationships on earth. Healthy boundaries created an atmosphere of healthy borders. I love this post! I always find myself trying to control whatever situation I’m in. This is such a sweet reminder of the boundaries God created for our good. Thanks for sharing! Thanks Sydney! I’m a controller too. God is slowly but surely teaching me that things are so much better when I just let Him be the One in control! Which is exactly what good boundaries do. This series is coming at the perfect time! This is something that I’ve struggled with my whole life. God has been really working in my heart to get these boundaries set with everyone in my life before I get married this fall. Praise God, Jocelyn! Getting a handle on this issue BEFORE marriage would be a giant head-start! I’ve been married 18 years, and I’m just now starting to really understand it from a Biblical perspective. This series is going to include a whole lot of Scripture, so I hope God will use it to teach us all – as He so faithfully does! Absolutely! His boundaries are for our good, our protection. I’m not always good at setting them, but I understand how important they are! Excited to read more of this series. Blessings! Yes! Thank you!! 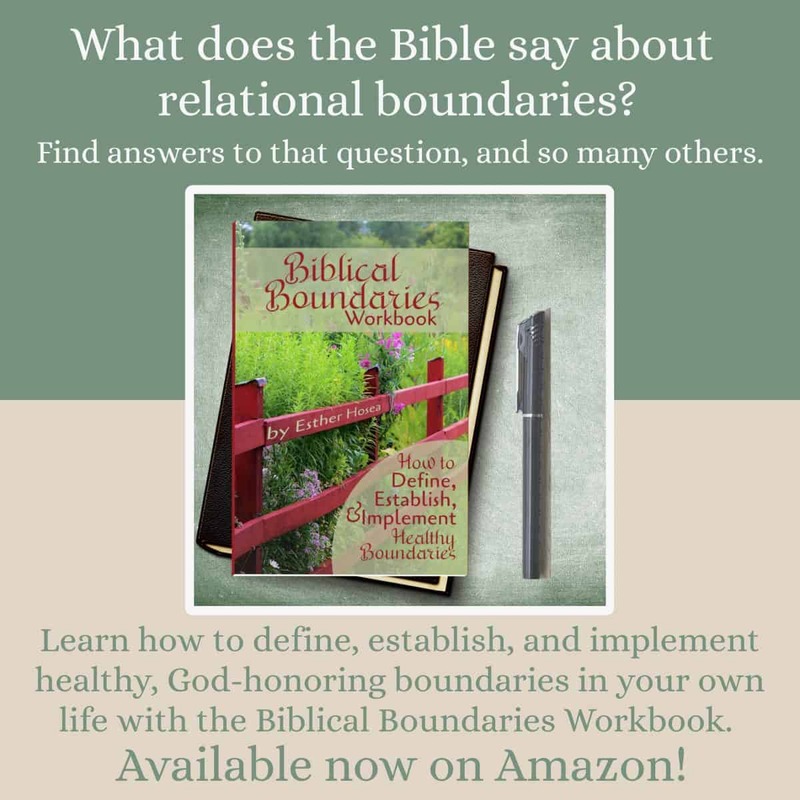 I’m a huge advocate of boundaries and recently went through Matthew and wrote a blog just on the examples in that book alone! God definitely has boundaries. Great article. What a great idea for a blog post Dani! Feel free to drop a link!